Forward into the past, this episode contains 100% more Lon Lopez! Join our Live Studio Audience this Sunday at 4PM! A flash from the past as we record live at Paul Cunha’s Star Wars themed 7 Stars Bar and Grill with Thanks But No Thanks Productions’ Lon Lopez! – What if you rewrote the history of your comics universe? And what if both DC and Marvel were doing it? – What’s in the Bag? – How much Guardians of the Galaxy news can come out in one week? – Star Wars Celebration Update: The fate of Carrie Fisher in Episode IX. – Nintendo, what are you doing? 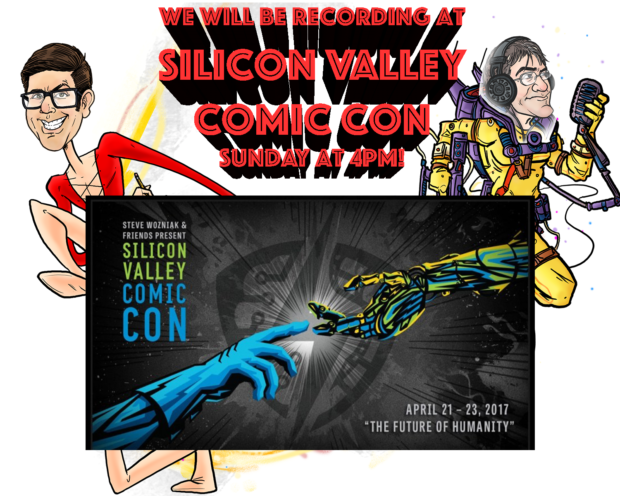 Make sure to drop by Sunday, April 23 at 4PM at Silicon Valley Comic Con and join our LIVE STUDIO AUDIENCE!